Kier-La Janisse was in town over the weekend to launch her book House of Psychotic Women at the Cinematheque. To highlight the event, she chose to present a screening of David Cronenberg’s The Brood (1979), one of the key films in the book. While the print, which Dave Barber obtained from the national archive, had noticeably shifted towards the washed-out red common to movies from the ’60s and ’70s, the biggest disappointment was that it was the censored version which undermines the final confrontation between Frank and Nola Carveth by rendering the “birth” of one of her sinister children all but invisible. One of the dominant themes of Cronenberg’s work is the fragility/mutability of our physical being. His films are full of transformations, generally violent, which repeatedly threaten to obliterate what defines us as human. In Stereo (1969), it was experiments with telepathy which undermine the ways in which we relate to one another socially; in Crimes of the Future (1970), a disease caused by cosmetics has killed all sexually mature women, causing an increasingly unsettling sexualization of pre-pubescent girls. Those first two features are highly experimental in form, but they laid the groundwork for the more commercial work to come. 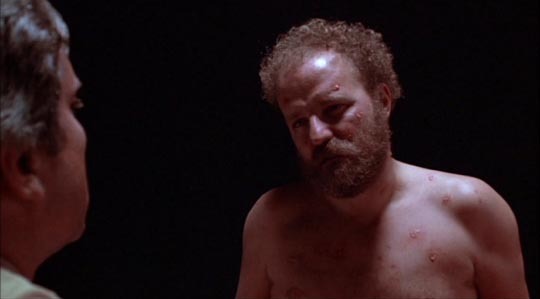 In Shivers (1975), a doctor creates an “intelligent venereal disease” in the form of parasites which pass from one resident of a deluxe highrise to another, triggering outbursts of violent sexual desire in order to perpetuate the infection. In Rabid (1977), an experimental surgical technique designed to restore severely damaged tissues inadvertently transforms an accident victim into a kind of vampire who ends up spreading a rabies-like plague which devastates Montreal. The overt sexual element in Cronenberg’s horror makes those early films distinctly uncomfortable viewing because it undermines what is generally viewed as an essential source of pleasure. This was one of the chief points in Robin Wood’s critical arguments against Cronenberg. That and the fact that there’s an undeniable discomfort with female sexuality running through the director’s films. But while the strength and implications of this latter vary in his subsequent work, the fascination/revulsion with transformed flesh remains strong in Videodrome (1983), The Fly (1986), Dead Ringers (1988), Naked Lunch (1991), and his brilliant adaptation of J.G. Ballard’s Crash (1996) in which the characters seek out transformation through the violent collision of flesh and technology. But 1979’s The Brood is at once Cronenberg’s most radical and most unsettlingly reactionary essay on these themes. 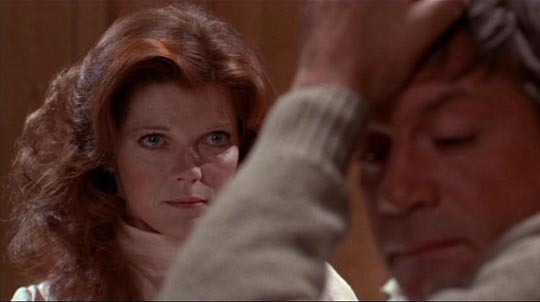 In The Brood, made the same year as Robert Benton’s Kramer vs Kramer, we come to the marriage of Frank (Art Hindle) and Nola Carveth (Samantha Eggar) when it’s already in ruins. Nola is in therapy at the Somafree Institute of Psychoplasmics, where Dr Hal Raglan (Oliver Reed) uses his radical therapy to expel neurosis and psychosis through bodily manifestations. The opening scene gives us an intense session with one of his patients during which Raglan’s aggressive role-playing produces outbreaks of pustular boils all over the man’s body. The effect is dramatic and disturbing, although it’s never entirely clear what the therapeutic benefit might be. Frank, obviously alienated from Nola, doesn’t really know what’s going on with his wife’s therapy, but when he comes to pick up their young daughter Candice (Cindy Hinds) after a regular visit, he’s shocked to discover bruises and bite marks on her body. An angry confrontation with Raglan ends with Frank saying he won’t allow the visits to continue, which he’s advised would be a bad idea. Needless to say it is a bad idea, though perhaps not as bad as the doctor’s therapeutic ideas. People around Candy start to die violently, apparently at the hands of deformed children. Nola’s mother, Candy’s teacher, Nola’s father … it all leads back to Somafree and the dark secret of psychoplasmics. As it turns out, Nola is Raglan’s star patient, a woman so full of anger that she has been giving birth serially to “the brood”, agents of her rage which act out her violent wishes without her even knowing. Where Kramer vs Kramer demonizes the mother for being a lesbian, reasserting the father’s patriarchal rights by giving him their child, The Brood has a more aggressive solution than child custody proceedings to the problem of an overly sexual/maternal woman who threatens male power: Frank chokes her to death to put an end to her demon spawn. This is where the censorship inflicted on many of the release prints (including the one screened last Saturday) does its real damage to the film’s narrative logic. When Frank witnesses the birth of Nola’s latest child, his appalled reaction triggers Nola’s final dangerous outburst of anger which is now directed towards killing Candy to keep her out of Frank’s custody … because, as she can clearly see, she and her “children” disgust him; he is horrified by the raw physicality of motherhood. But with the birth all but cut out, his disgust seems less than fully grounded. In the full version (available on the MGM DVD), we see what he sees: Nola tearing the external placental sac open with her teeth, raising the bloody baby to her mouth and then licking it clean. Here motherhood is reduced to its primal animal roots, but even worse the male has been rendered completely unnecessary (as in a way the wife’s “conversion” to lesbianism in Kramer has “unmanned” the husband). While the immediate narrative motor is saving Candy from death at the hands of the brood, the killing of Nola is the culmination of the film’s thematic view of mothers as carriers of generational harm. Nola’s own mother beat her while her weak father turned the other way; now Nola herself is threatening her own child and Frank can only save Candy by killing Nola. Not that it really helps as in the final few shots as he drives Candy away from Somafree we can see the beginnings of psychoplasmic eruptions on her arm. As Robin Wood argued, there is a regressive tendency towards sexuality and the body in Cronenberg’s work, and yet the director’s films are often powerful dramatic and emotional experiences. We respond to movies in many ways and on many levels, which is why I can still enjoy Cronenberg’s films for their ideas, their invention, their moments of powerful horror, often their humour, while nonetheless being fully aware of their sometimes problematic ideological implications. The Brood has always been my least favourite of his early films, but seeing it again on the weekend I appreciated it more than I used to. On several levels it’s an advance over the pulpy pleasures of Shivers and Rabid, but particularly in its treatment of character. The delineation of the ways in which people damage each other is more disturbing than the biological horrors. Nola’s parents’ marriage was broken long ago and they now live apart, both of them embittered, self-pitying alcoholics seemingly unaware of the harm they did their daughter, which is the clear root of the horrors unleashed by Dr Raglan’s unorthodox treatment. The reactionary core of the film lies in its understanding this and yet still seeing Nola as a monster who must be destroyed in order to restore “normality” … that is, to restore the man’s position of authority. The fact that this restoration is doomed to failure, however, complicates a simple ideological reading, making The Brood an unsettling example of the uncertainty which marked horror movies in the wake of Night of the Living Dead (1968); where traditional horror was largely about overcoming disruption and reestablishing the status quo, after the ’60s the genre has more often been about the impossibility of bourgeois standards of security. All human beings carry the possibility of monstrosity within them, as Nola does here; and yet despite the seeming gender imbalance in Cronenberg’s film, Raglan is actually the generator of her monstrosity and Frank’s act of murder ultimately solves nothing, making him something of a monster himself. The ultimate conclusion here is a despairing nihilism rather than reassurance. The Brood is also an advance in terms of performance, with Reed and Eggar far more powerful presences than the exploitation-level stars of the earlier films. The many minor characters are also well cast, enriching the film’s texture. This entry was posted in Review and tagged Canadian Film, Directors, Film Criticism, Horror. Bookmark the permalink.